Place chicken carcass (and any leftover skin and meat and other bones) in a large pot and cover with cold water. Add bay leaf, and bring to a boil. Reduce heat, and simmer 60 to 90 minutes. Remove from heat, cool slightly, and strain. Remove chicken meat from carcass, and chop into bite-size pieces. In a large saucepan over medium heat, melt butter. Cook onion and shallots in butter until translucent. 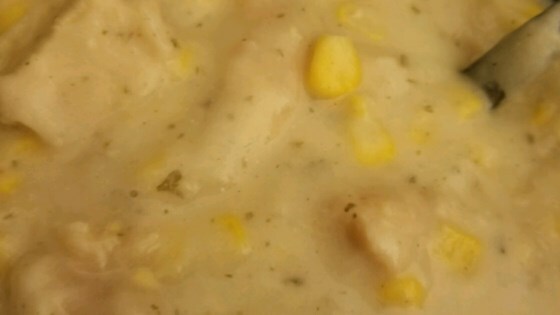 Pour in strained broth and chicken meat and stir in bouillon, parsley, salt, pepper, potatoes and corn. Simmer 15 minutes, until potatoes are cooked and corn is tender. Remove from heat and stir in cream. I was really disappointed that there wasn't more flavor to this. I added mashed potato flakes to thicken it up a bit and used fat free half & half. Canned corn also works just as well. This was a really tasty chowder! Even my daughter who is not a corn eater liked it very much! It was so yummy and it fed us (3) for days when it was coooold...excellent and easy. What a great recipe. This is a hearty chowder is full of fresh vegtables. Is a light bodied chowder. Will make this as a standard meal in cold months to come. A very healthy choice! THIS WAS ABSOLUTELY AWESOME! THE ONLY CHANGE I MADE WAS ADDING A LITTLE MORE CREAM. THE TASTE WAS FABULOUS!! !